A good storyteller plays with the audience’s mind by using their actual fears – the shadows on the wall, the corners of the room that scare at night, that old lift in the building. Kannan Iyer takes the age old lore of witches and witchcraft and sets it right into our daily modern lives giving us one of the few chilling and superbly shot horror films. Bobo (Emraan Hashmi) appears to have everything going for him – he is a famous magician, has a sweet girlfriend Tamra (Huma Qureshi) and an about-to-adopt son. Except that he seems to be hearing a voice which no one else can making him impossible to concentrate on anything anymore. He knows that it’s linked to his past; the murder of his kid sister which he can’t remember about. And when he starts recalling under hypnosis about what really happened those many years ago, he is sure that what destroyed his childhood then has come back to haunt his life again. With Makdee, Vishal Bharadwaj had given us a very folksy story about a daayan /witch who eats kids. 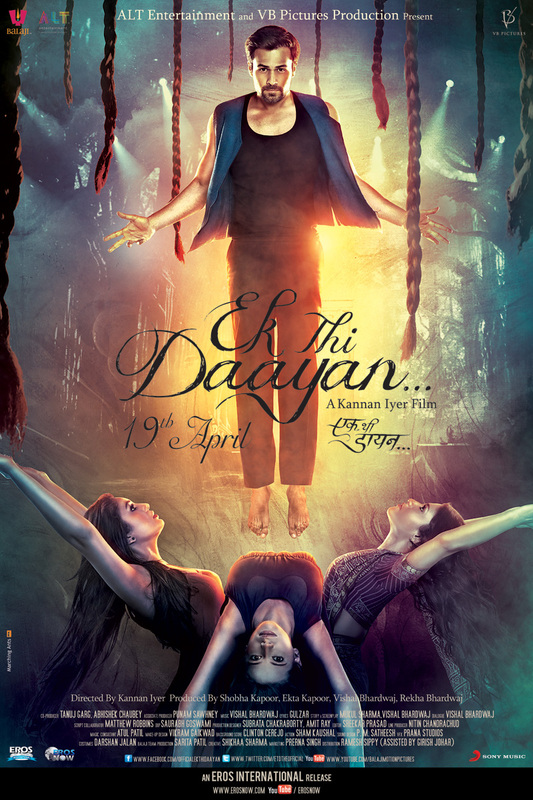 For Ek Thi Daayan, along with Mukul Sharma, he brings the daayan to the city of Mumbai, into our very buildings. The ulte pair, the significance of number 666, the fascination of the witches with kids, the lizards…it’s all still there but deftly incorporated into the story so that it starts seeming real to you. The first half leaves you chilled to the bones, but the second half undoes its effect. The story gets messed up and what was definitely a great build up in the film ends with just a sad barely there fizzle that leaves you thoroughly disappointed. What could have ended up as being an amazing horror movie leaves you dissatisfied because of the climax which looks straight out of a Mahesh Bhatt’s Raaz series movie. Why O Why Vishal! The best and definitely the most scary part of the movie is the flashback which Emraan has of his childhood. The kids are incredible with the young Bobo, who reads secretly about witches, convinced that the new woman in the building – who his dad has taken a fancy to – Diana (Konkana Sen Sharma) is really a daayan. The easy banter between the kids and their dad (Pavan Malhotra) is cute and invokes genuine laughter until Konkana’s entry which perfectly turns this into a dark film. Konkana gives an amazing performance, invoking terror with such ease that it takes you a couple of minutes to shake off her creepy lurking image in the interval. In what is easily one of the most chilling scenes, Diana plays hide and seek with the kids at home and the pin drop silence in the theatre was enough testimony of the impact her evil avatar had on everyone. Emraan Hashmi does justice to his haunted, troubled character of Bobo but like a gentleman, lets the ladies take the center stage. Huma gives a commendable performance as Tamra who is affected by Bobo’s obsession with witches and wants them to start a new life afresh. Kalki Koechlin plays Lisa Dutt, an NRI who comes to Mumbai as she is a great fan of Bobo but looks really mysterious. Although her screen time is restricted, Kalki is a pro at eccentric characters and Lisa is no different. But do they both get shadowed by Konkana? Hell yes! The songs, like in any Bollywood horror movie, stick out like sore thumbs and slow down the narrative. Saurabh Goswami’s cinematography though sends a chill down your spine. You might not end up looking over your shoulders after watching this movie but there are enough chills to shake you. Till we get the Hindi horror movie which does that, watch this for Konkana and the first part which makes you realize that there’s still hope for Bollywood.